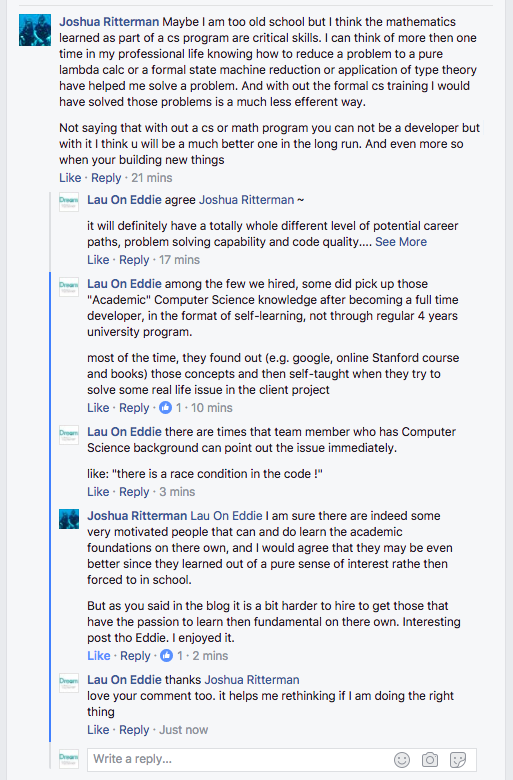 my friend Joshua posted a valuable comment after reading my blog post. so, instead of include the points in my original post, I think it is better to enclose at the end for everyone to read as well. 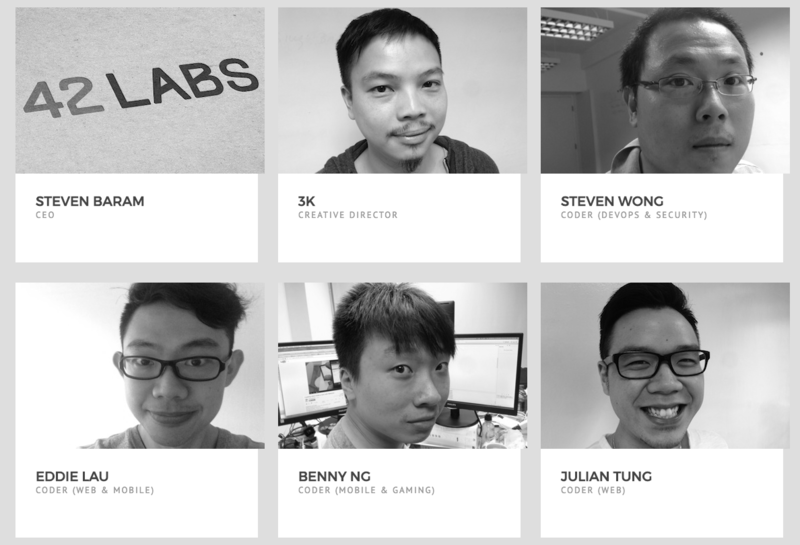 F5 Works (and 42 Labs, my previous company) hire non Computer Science graduates (and non university graduates) which most companies in Hong Kong won't. I received lots of questions regarding the reasons and feasibility behind. Here are some of the highlights of the conversations. Developer job requires Computer Science degree ? hiring manager thinks employees should at least know the basics that are being taught in University curriculum. they believe candidates after going through the university years has better mind set on doing real development work. most of the "knowledge" and "training" in university curriculum are not applicable in real world development. mind set and decision making training is more effective in real world development environment, which may take only few months to achieve certain level. How do we evaluate candidates ? have built any software before ? self-learnt any programming languages before ? good at problem solving ? like picking up responsibilities ? like learning and reading ? know what he/she is doing ? know what he/she is looking for ? For those you hired before, what are their background ? Are they still with you ? Where are they working now ? Most of them have left when we close 42 Labs. Almost everyone of them became full stack by the time they left and immediately being hired (well paid $$$) by other local tech teams. 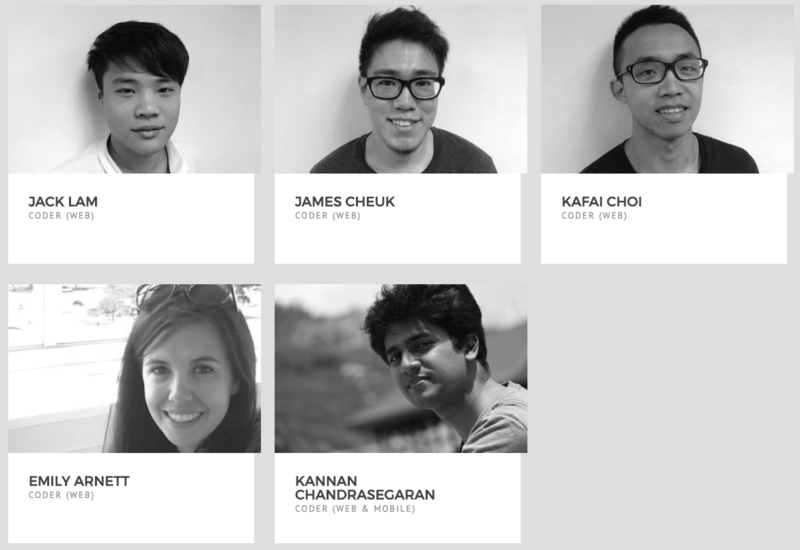 They have the skill and mindset that every tech team wants. I am so so glad. we send free online courses to them and ask them to finish in a defined timeframe. Some take few days, some take few months. After proving themselves having the self-learning capability and attitudes, we would hire them as junior. It may matters to the subject we are talking about too, so let me include this topic here as well. Everyone in the team has to know web development. Most of our mobile projects also use web tech to build (:heart: Ionic). The reason I think it may matter as well, because once the junior developer has picked up a subset of skill (e.g. CSS positioning), then he can be immediately be productive in several projects. How do we justify "ready" and "productive"
There are lots of consideration in both the candidate capability, current company situation and faith. But fundamentally it is more a business thing. General rule is that we believe candidate's * output > input, in reasonable period of time*. How do we find them ? hm ... we did have some job posts on some free job boards but most of them found us directly or through friends of friends. Most of our founders teach programming courses and attend coding events regularly, most of the people we met know that we are training developers from scratch. Why it works for us ? We did have candidates not able to be "productive" after 3 - 6 months. We explained the situation to them, let them go and even help them to find another more appropriate development jobs for them. Why it may not work for you ?